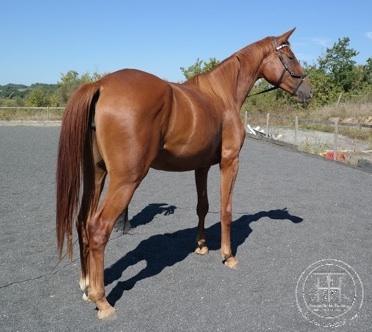 This page is where we share the progress of our two beautiful Dressage warmbloods purchased in 2011 from the Haras de Hus in the Loire-Atlantic region of France. 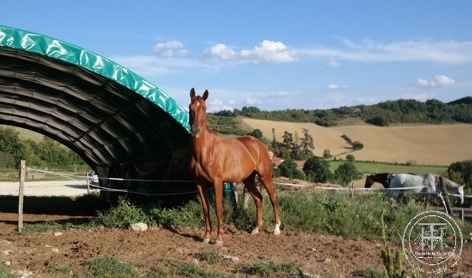 Over the last fifteen years we have been taking in all types and breeds of horses with all manner of problems. Such horses are usually the ones who cannot compensate adequately for the shortcomings of the human beings in their lives, and end up being rejected. It is only because we had to make everything as balanced and healthy as possible for these wonderful equine teachers - to help them back on track - that we began to understand what holistic horse management and training actually means in practice. 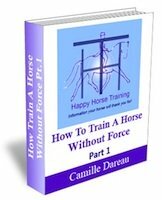 We learned how to ride in a way that does not expect the horse to fill in the gaps, and compensate for our weaknesses, and we learned what horses need in their everyday lives to be balanced and tension-free. Putting the horse's well-being first has always been our foremost intention, and so we don't sell attempt to replace or find better versions of the horses we have. Although the horses we have rehabilitated and learned so much from are here to stay, and continue to teach us, we decided we would like to work with a horse which was truly made for the art and gymnastic practice of dressage. 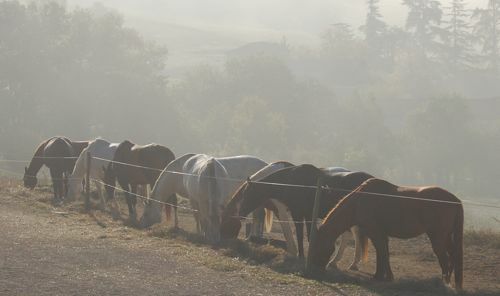 We wanted also to test out our training without tension, because the everyday horses we work with are all happy, healthy and supple in their work, but they will not necessarily progress to more advanced work without conditioning and force, and that is a route we have no interest in going down. Quaramba, an Oldenburg, at 3 1/2 years old, getting used to the arena. The dressage warmbloods being bred today are incredible athletes. 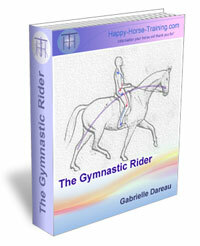 They have fantastic suppleness in their joints and suspension in their movement before they are even trained in any way. Sadly the vast majority of these horses are also trained with forceful techniques. At a certain age they 'progress' to being ridden with spurs and double bridles. In our estimation, the spurs are only employed because the horses have gradually become deadened to the leg and so reluctant to go forward into the wall created by the rider's hands, that spurs are the only way to keep them moving at all. 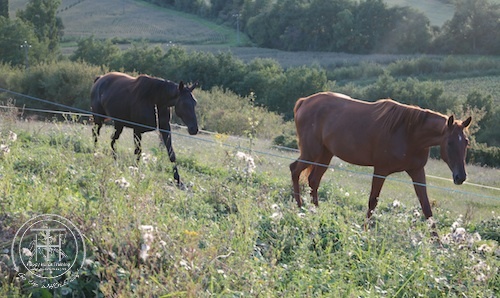 Likewise, the double bridles are the quick fix method of raising horses up in front and rounding them up in the neck. This bears no resemblance at all to the gradual strengthening and development of the horse's postural ring, which includes the telescoping of the neck, working in conjunction with the tucking of the horse's pelvis. 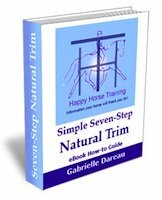 The bit itself has no function in balancing the horse, and is only a means of connecting the rider to the soft jaw of a horse truly working on their postural ring. Djinnie, a Hanoverian, taking the first steps in her training journey. 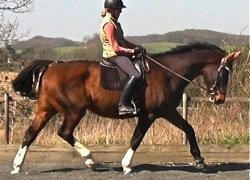 So we are also interested to see if we can match the athleticism of our dressage warmbloods with our own riding ability, and see if it is possible to train them with neither force nor conditioning to the highest levels they are capable of. We are aware that because our training structure is all about feel and not appearances, it is not always easy for us to share that with a larger audience. Everyone who visits HHT, connects with our horses and feels how they move, has the highest regard for our work, and they are often more impressed by our 'ordinary' horses than the super horses they have been riding at home. 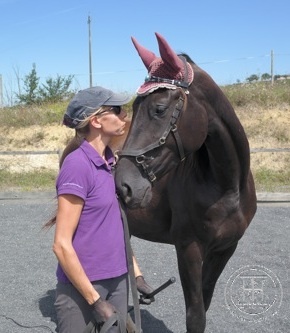 It is difficult to convey feelings over a visual media however, so we are hoping our dressage warmbloods will manifest the aesthetic qualities enough that people can really start to see the truth of engagement - channeling a horse without force and without teaching them specific conditioned responses to certain aids. The youngsters, best of friends, in their Paddock Paradise, which encourages movement, liberty and stimulation. It is also of great importance for us to have the opportunity to illustrate how much healthier and more balanced dressage warmbloods are when they are living outside all the time in a highly social environment, unshod and eating a low-cereal forage based diet. We see, every day, the damage done by shoes, by solitary lifestyles, vaccinations, drugs and forceful training techniques, and we want to show people that there are only options. You can choose. There is no necessary sacrifice, only destructive practice or holistic, healthy practice. We hope you enjoy Djinnie and Quaramba's progress over the years as much as we do!